Continue on this page to read a brief description of the Logic of Feeling for organisations, or go directly to what this means for selecting an approach for organisational change or development. The essence fo the Logic of Feeling is learning to think or reality in more than one knowledge system. People’s learning in a collaboration is developed in three phases. From internal steering (what do we need as persons) to external steering (what rules do we agree upon to coordinate work) to communicative self-steering (how does what we are doing fit in with with what we want to be). 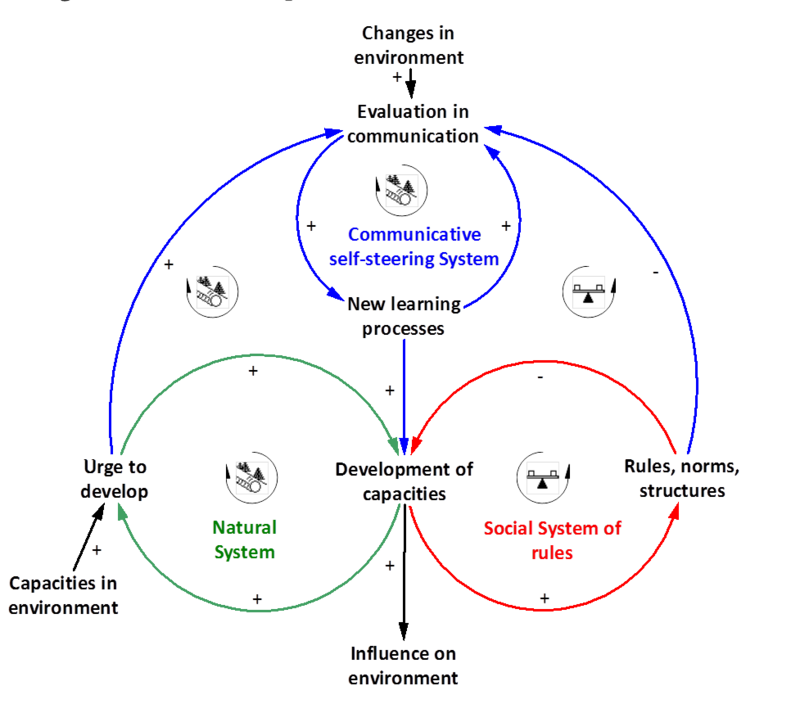 Figure 1 shows how development of capacities, the learning process, matures in three phases. You can apply this model to every level of organisation, from an individual to a whole society. In my description I will speak of ‘the organisation’, where you can keep your own particular organisation level in mind. It is important to choose this focus before applying the model. Naturally, real life is much more complex than a model, and confusion can easily arrise when it is not clear whether we are talking about a department, an entire company, or a network. I will give an explanation now of the three development phases. First, the Natural System is developed. This is made up of the characteristics of the people present and the relationship that arise, the power relations. The development of the Natural System is steered by the internal motives of the individuals involved, the drive. For organizations, I call it the dimension of the will to grow. It is assumed that every living being and every organization wants to grow, wants to expand itself. The Natural System contains all informal attributes of the organization (the part of the iceberg that is underwater). It determines whether people feel at home. The memory of the Natural System is unconscious to a large degree. These unconscious “steering codes” manifest themselves in symbols, myths, stories, and rituals. These customs still stand out to the new employee, whereas others find them normal: that’s how we do things here. Internal steering that is too weak creates feelings of fear, whereas internal steering that is too strong leads to aggression and oppression. The Natural System is made up of the characteristics of the people present and the relationship that arise, the power relations. The development of the Natural System is steered by the internal motives of the individuals involved, the drive. For organizations, I call it the dimension of the will to grow. It is assumed that every living being and every organization wants to grow, wants to expand itself. The Natural System contains all informal attributes of the organization (the part of the iceberg that is underwater). It determines whether people feel at home. The memory of the Natural System is unconscious to a large degree. These unconscious “steering codes” manifest themselves in symbols, myths, stories, and rituals. These customs still stand out to the new employee, whereas others find them normal: that’s how we do things here. Internal steering that is too weak creates feelings of fear, whereas internal steering that is too strong leads to aggression and oppression. For efficient cooperation in the organization, additional steering is needed over the Natural System’s drive for growth. For this reason, people in the organization develop agreements to create order. These formal attributes make up the “Social rule System”. The memory in the Social System is in rules, procedures, organizational structures, job descriptions, management systems, etc. For efficient allocation of people and resources, discipline is needed to fulfill agreements made and adjust them where necessary. The degree of discipline determines how much coordinated collaboration is possible, but also if mistakes are allowed to learn from them. Too much discipline inhibits learning and stifles creativity, which produces feelings of oppression. Too little discipline results in chaos and anger because things are poorly organized. At a certain point, strong growth from the Social rule System no longer results in further development of the organization. More of the same offers no innovation and may also result in bureaucracy. We must ask the question: “How does what we are doing fit with who we want to be as an organization?” This asks for a new system that evaluates and controls the Natural System and Social rule System. This is possible through communication with relevant persons. Cornelis calls this the System of communicative self-steering. Here, the memory consists of the intentions of a person or organization: What do you want to learn? What kind of organization do you want to be? Development of communicative self-steering creates a feeling of recognition, of doing meaningful work. Too little self-steering creates a feeling of de-pression, and too much self-steering results in disorientation and frustration. In this way, every organization develops its own “Logic”: a set of steering codes as models for what is Logical. These models are stored in the memory. The memory of the organization contains the largely unconscious memory from the Natural System (the “tacit knowledge”) and the conscious steering codes from the Social rule System. A crucial point in this model is that one layer is not any more important than another. For complete and thorough development, you cannot miss any of the three layers. One system builds on another. Also bear in mind that this does not concern the development of individuals, but rather the entirety of the organization that you have in mind. People’s feelings have an important guiding function in this model. They tell us what system an issue is operating in. Thus, problems in the Natural System manifest themselves in fear, abuse of power, and aggression. Conflicts in the Social rule System manifest themselves in anger and disputes over application of the rules. Problems in the system of communicative self-steering concern miscommu-nication and manifest themselves in protests and demonstrations. It is important to examine what systems the steering codes come from, because the learning processes will be disastrous if you are trying to explain a phenomenon from one system with explanations from another system. In an existing organisation, the system of internal steering is always present. The system of external steering can be strongly or weakly developed. The system of communicative self-steering is often weakly developed in organisations because performance pressure limits time for development of communication and reflection skills. 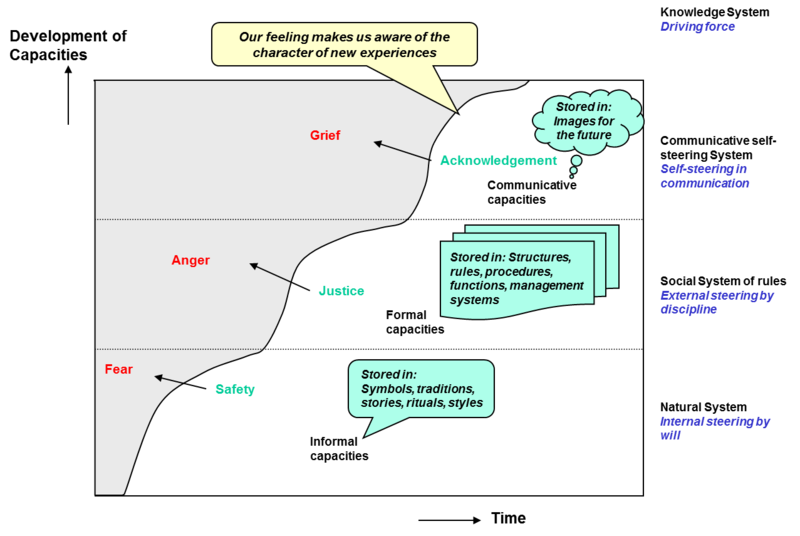 The Logic of Feeling is a cybernetic model, showing dynamics of development of capacities in an organisation, caused by driving forces in the three knowledge systems. In the discipline System Dynamics, relations between variables are usually presented in two modes: a representation over time, such as in Figure 1 above, and a representation of driving forces in a so called Causal Loop Diagram (CLD). Figure 2 shows the dynamics of the three knowledge systems as CLD.